This short video will introduce you to the site. Click on the arrow 1 to expand the result and see additional information about a particular search result. Use the "Narrow By" facets 2 to refine your search and further limit search results. 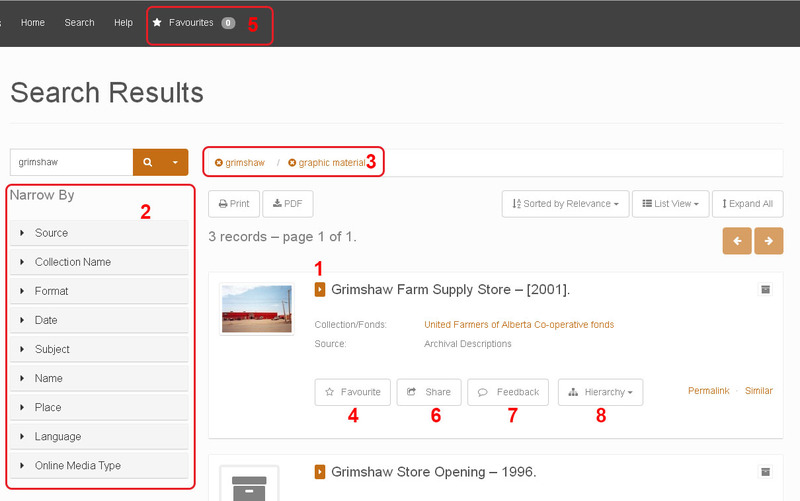 You can remove facets to expand results by clicking on the selected facets indicated in orange 3. Click on the "Favourite" button 4 to add a search result to your list of favourites. You can use favourites to save a list of results for your own research, or email them to our archivist if you have additional questions about a particular set of records. To view your list of favourites, click on "Favourites" 5 at the top of the page. Click the "Share" button 6 to share a particular result through social media services including Facebook, Twitter, Google+ and Pinterest. Click the "Feedback" button 7 to send an email to the archivist. You can use this feature to provide additional details about a record and help improve our data or ask a question about a record. Click on the "Hierarchy" button 8 to see how a particular record fits within the collection it belongs to. This can be useful in finding similar and related records. Which will give more value to the term "elevator"